You may be experiencing issues with the timer, earning mailing credits, or even pages loading. There are a couple things to check which usually solve the problem. First, if you use Avast Virus Protection, you may have the Avast Internet Security browser plugin enabled. Version 9.0+ includes an option which blocks social network integrations. ListSurfing has a deep integration with social networks causing the loading issue due to Avast. After clicking on "Settings" you will see a window with several options. 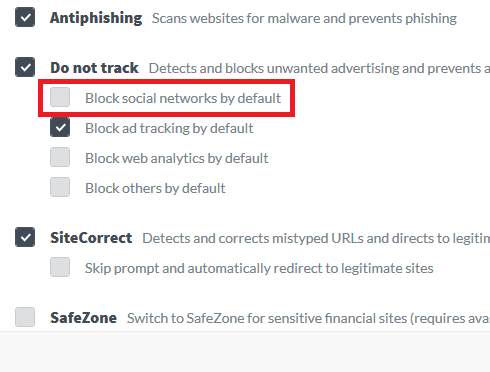 You will need to make sure the "Block social networks by default" option is NOT checked. If that doesn't resolve your issues, we recommend clearing your web browser Cache. Sometimes data gets saved causing session conflicts. Many times clearing cache has resolved problems with timers and collecting credits. Firefox: Instructions (click). Where it shows you how to delete "Cookies", you can check off "Cache" instead or in addition to the cookies. Internet Explorer 9: Instructions (click).